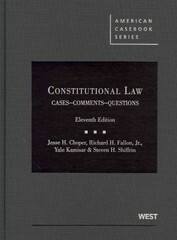 Constitutional Law 11 Edition This long-popular constitutional law casebook has been thoroughly revised and updated. The Notes and Questions, which have long been a hallmark of the book, present a wide range of perspectives for students to consider, rather than reflecting a single point of view that users of the book must either adopt or teach against. Professors will especially like the illuminating and provocative extracts from the literature that accompany the recent "right to bear arms," "war on terror," and "corporate political campaign expenditure" cases. Chapters on the Dormant Commerce Clause and State Action have been significantly reorganized; and the Equal Protection sections on school integration and affirmative action have been enlarged to account for Parents Involved v. Seattle School District. The authors have significantly tightened the material on abortion, procedural due process, and takings.